Starting Electronics Needs Your Help! How to use the Analog to Digital Converter (ADC) Atmel Software Framework (ASF) driver to initialize and use the ADC on an Atmel ARM Cortex microcontroller. In this part of the ASF ARM tutorial, the ASF ADC driver is used to initialize the ADC and read the analog value from one of the ADC's channels. The ADC is polled by software to get the channel value. The result of each ADC conversion is sent out of the serial port of the ARM microcontroller and displayed in a terminal window. 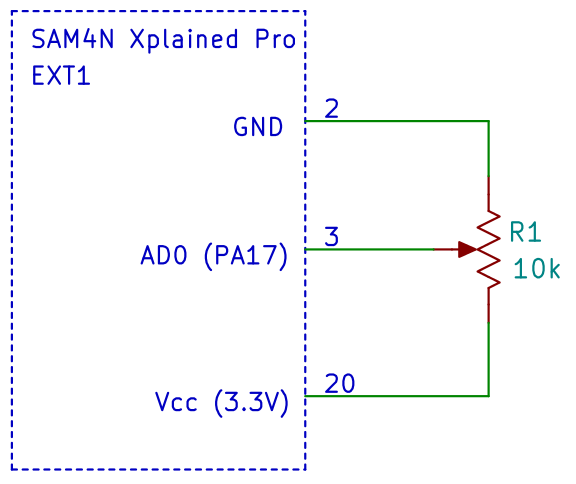 An Atmel SAM4N Xplained Pro board with ATSAM4N16C microcontroller is used in this tutorial. Make the necessary changes to the software and hardware connections if you are using a different board. A 10k potentiometer is connected to pin header EXT1 of the board with one of the outside pins of the pot. connected to GND and the other outside pin connected to Vcc (3.3V). The centre wiper of the pot. is connected to PA17 which is AD0 of the ADC and pin 3 of the EXT1 header. The images below show the physical connection of the potentiometer to the SAM4N board and the circuit diagram of the pot. connections to header EXT1. As with the previous part of this tutorial series, a terminal emulator will be needed such as Tera Term for Windows. Create a new ASF project called adc in Atmel Studio as explained in the new ASF project quick start checklist. 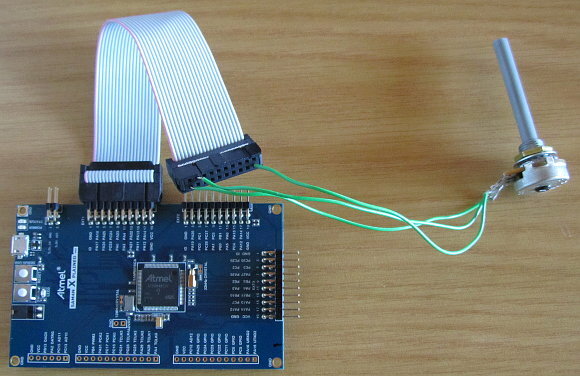 This project uses printf() to output text to the terminal window over the serial port, so the project is based on part 11 of this tutorial series which uses a UART for stdio functions. Add the following modules to the project using the ASF Wizard. The ADC driver ASF module adds the ADC functionality to the project. IOPORT and Standard serial I/O are used to set up the UART for stdio functions. UART0 is defined as the console UART as it is connected to the EDBG virtual COM port on the SAM4N Xplained Pro board. Uncomment the USART settings in conf_uart_serial.h as shown in the code listing below. Be sure to set the UART name (CONF_UART) to point to the correct UART for the board. The UART pins are configured in init.c. The main application code sets up stdio functions to use the UART. ADC channel 0 is then enabled and polled in the main loop. Values from the ADC are sent out of the UART serial port and displayed in a terminal window. In the while(1) loop, the ADC conversion is started. A bit is then polled in the ADC_ISR register which will be set when the conversion for AD0 is complete. Polling of the register is done by calling adc_get_interrupt_status(). When the conversion is complete, the ADC value for channel 0 is read from the ADC and sent to the terminal window. The video below shows the above ADC program running.